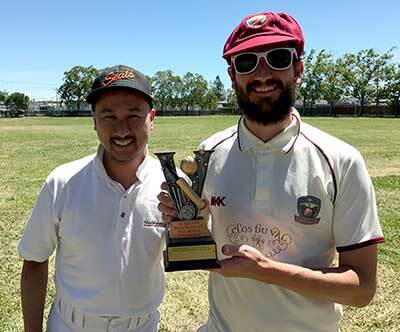 SF Seals captain Jack Tse (l) presents NVCC captain Brendan Helme with the Vino Cup following NVCC’s win over the Seals recently. The omens were good for Helme when he won the toss – the first time NVCC have won it in 2018 – and had no hesitation in asking the Seals to bat. Helme had a formidable bowling attack at his disposal and he was determined to make use of it. An early breakthrough for NVCC for Martin Mackenzie with Leigh Ritchie talking a sharp catch saw the Seals one down with only three runs on the board. Three balls after that the second wicket fell to Sorabh Das. This brought Seals opener, Brad Busch, and Gwynn Hoskins together and the pair added a substantial 33 runs for the third wicket and dragged the Seals back into the match after the loss of the early wickets. In the ninth over, while just about to up the run rate, Busch was out to a stunning caught and bowled by the New Zealand born left-arm medium pacer. Tim Mills. Sukhvirsra Singh (23 runs off 24 balls) (NVCC player but subbing in for the Seals due to short numbers) joined Hoskins and continued to help the Seals put on runs. Once both Hoskins and Singh had lost their wickets, to Mills lbw (leg-before-wicket) and bowled by Das respectably, it was a quick finish to the Seals innings as the tail-enders came and went without making any impact. The Seals ended up with 95 runs off only 24.4 of their 35 alloted overs. After an early lunch NVCC took up the chase with Australian Pete Carson and South African Adriaan Foot opening the batting. Carson stuck around to score eight off 23 balls while Foot was gone quickly on his second ball, having scored a four on his first ball! The middle order fired for the NVCC with double-figure contributions from NVCC top-scorer Sarabjit Singh (19 runs off 12 balls), Harjit Singh (14 off 22), Martin Mackenzie (10 off 36), and Das (12 off 18). NVCC wrapped up the chase after just 22 overs with 99 runs on the board and so secured their first victory in five attempts in 2018. NVCC captain Brendan Helme pictured presenting SF Seals player Gywnn Hoskins with the Clos du Val man of the match award for his performance with the bat, ball, and in the field. 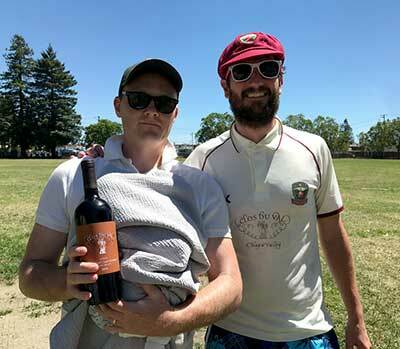 After the match the Clos du Val Man of the Match award was presented by Helme to SF Seals Gywnn Hoskins for his excellent contribution to the match with both bat – 16 off 20 – ball – 2 for 13 off 4 – and in the field with two catches. 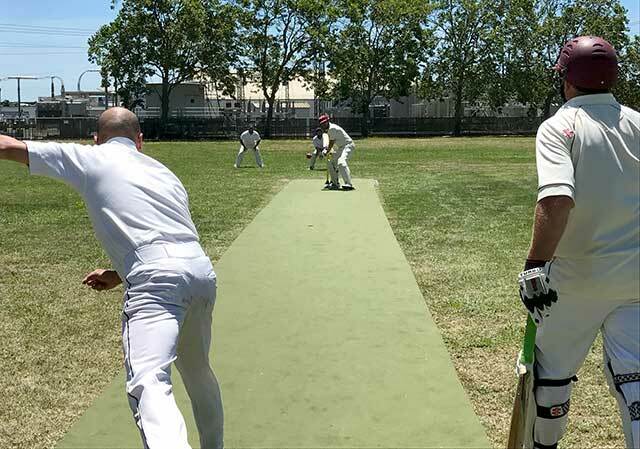 Saturday 14th June, 2018 – NVCC host the Marin CC Socials on the Midway Green at the Napa Valley Expo in downtown Napa from 10:30am. SF Seals captain Jack Tse bowls to NVCC batsman Adriaan Foot while Pete Carson (r) looks on.